Founded in 2003 Worldwide Escapes is an award-winning luxury travel agency based in Alderley Edge, Cheshire. We are convinced that luxury travel cannot be found from leafing the pages of lifeless brochures or endlessly scouring the Internet for the latest holiday offers. Instead we believe that your travel needs are individual and that we must perfectly tailor a holiday to suit you. Do more than just dream of adventure or relaxation, of remote islands and thriving cities, experience them for yourself in your own unique way. Be inspired by our genuine love of travel, by the places we have seen and the knowledge we wish to share with you, our clients. We act as your own personal travel advisors committed to providing only the highest levels of service from beginning to end. No matter how simple or complex your travel needs may be, our close relationships with tour operators, global airlines and hoteliers, as well as villa, private jet, cruise and yacht charter companies enables us to assist you at every turn. Our world is one without limits, one without compromise and one with financial security and peace of mind. Virtuoso is an exclusive invitation only network of the best luxury travel agencies worldwide. Representing the best of the best in travel, Virtuoso advisors use their global connections to plan the most memorable experiences for their clients, from weekend getaways to dream holidays. Less than one percent of travel agencies in the world are admitted for membership in this renowned network of luxury travel specialists, which represent combined annual sales of more than $15.5 billion in luxury leisure travel. Benefitting from the incredible buying power of Virtuoso, we are able to not only offer the most competitive pricing in luxury travel, but also special added-value amenities, at no cost to you. Click here to explore Virtuoso. Life is to be lived to the full, an ongoing journey of discovery and ever-expanding horizons. For those with an unquenchable thirst for new experiences, we can offer a vastly diverse range of holidays. Our team of experts are dedicated to understanding your interests and designing a bespoke holiday as individual as you. We can take you to the corners of the globe to excite you whatever your passion – the scope is as boundless as your imagination. Let us arrange the destinations and you create the memories. We take financial protection seriously at Worldwide Escapes. We hold an ATOL licence and are members of ABTA. As a company who believes in best practice we also operate a segregated client money account. Worldwide Escapes holds its own ATOL licence 10587 and acts as an agent for ATOL holders. All the flights and flight-inclusive holidays on our websites are financially protected by the ATOL scheme. When you pay you will be supplied with an ATOL Certificate. Please ask for it and check to ensure that everything you booked (flights, hotels and other services) is listed on it. Please see our booking conditions for further information or for more information about financial protection and the ATOL Certificate go to: www.atol.org.uk/ATOLcertificate. We firmly believe that the the enjoyment of your holiday starts not from the arrival at the airport or resort but from the minute you pick up the phone or visit us in person to plan you arrangements. With this in mind our travel lounge concept was designed to provide our clients with a welcoming, comfortable and informal space for you to talk openly with us and receive the privacy, discretion and one-to-one consultation as if being in the luxury of your own home. Take advantage of our complementary concierge service upon request we can arrange all of the smaller incidental additions to your holiday arrangements that make all of the difference and ensure that it truly is a worldwide luxury escape to remember. Worldwide Escapes are extremely proud to have won the award for ‘Best Travel Agent’ at the prestigious Guardian and Observer Readers’ Travel Awards in both 2012 and 2014. We were proud to scoop this first major accolade in 2012 at the awards ceremony held in Ghent after scoring a perfect 100% rating. In 2013 we took the Runners Up spot before returning to win again in 2014 and collected this highly coveted readers award at the gala dinner in Agadir, Morocco. I have used Worldwide Escapes, without exception, for over 9 years. Their professionalism, knowledge and attention to detail is unsurpassed. I would have no hesitation in recommending them wherever the destination, and whatever type of holiday is required. Worldwide Escapes have arranged a number of my family holidays – we have three daughters under the age of 8. Our destinations have mainly been to the Caribbean and Mauritius. We have followed Worldwide Escapes guidance on resorts and destinations and have not been disappointed. The best thing about the Worldwide Escapes team is their attention to every aspect of your holiday. Worldwide Escapes have organised our holidays over the passed few years and what a difference they have made to our lives. So far, our greatest adventure was an 8-week round the world trip. After thorough discussion, Worldwide Escapes planned a complex itinerary that included 19 destinations, 24 international flights, limo transfers and an array of amazing hotels. They took away all the stress and made the process very exciting and enjoyable. Nothing was too much trouble for them and everything went without a hitch. Worldwide Escapes always provide an outstanding service – they understand our needs and provide creative and relevant ideas for holidays – we have not once been disappointed. On one of our recent holidays we had a mini-crisis – we called the team and they were the model of calm and helpfulness, checking traffic reports and looking at new/alternative flights. Fortunately we made our original flight but their professionalism and willingness to help was a great comfort. What can I say – we had the most wonderful holiday, from the moment we were picked up by the chauffeur to the time we returned home. One & Only The Palm is amazing. Room was gorgeous, food was fab and the staff were so friendly. How did they all know our names? Thank you for suggesting this place – it was perfect for us. Hopefully we can return next year. I have had the pleasure of dealing with Worldwide Escapes over the past four years, for all our travel needs. They have always provided an exemplary service and have come to know us as clients and our likes and dislikes. Our requirements are always booked and checked down to the last detail, with the added assurance that they are only a phone call away, should any unexpected problems occur. I can’t recommend Worldwide Escapes highly enough! 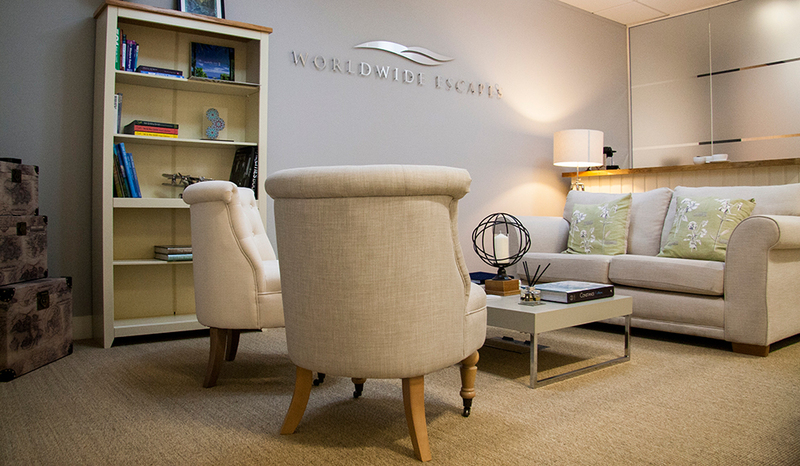 We have used Worldwide Escapes for many years and they have always surpassed expectations. Nothing is ever too much trouble, no matter how large or small the request. Unfortunately a few years ago, I had to return home from holiday due to family illness, leaving my family behind. One phone call to Worldwide Escapes and I was home within a few hours. We look forward to using them for many years to come and wish them continued success within the travel industry! Over the last 4 years we have developed an amazing relationship with the team. We have had a few occasions where we have needed extra support whilst away – we had two of the children go down with Chicken Pox whilst in Crete and help was available immediately, liaising with the hotel about extending our stay, changing our flights and offering untold support for us all. I recommend Worldwide escapes to all my family and friends!